Six year old Imogen Ashwell-Lewis, who was diagnosed with cerebral palsy at birth, reached the top of South Wales’ highest peak on Sunday 7 October in a specially-modified four-wheeled mountain bike. She was joined by more than 40 people – including Specsavers staff from South and Mid Wales, charity workers and even army soldiers – some of whom were harnessed to her to help pull and push her along. The Pen y Fan challenge was co-organised by Cerebra and staff at Specsavers stores in South and Mid Wales, as part of their year-long charity partnership. The opticians are raising funds for the Carmarthen-headquartered charity, which currently supports 4,500 families across Wales. Neil Robinson, West Wales regional chair for Specsavers, says: ‘Imogen and her family are an inspiration to us all, as are the services and support Cerebra provides to them and many other families across Wales. Watching Imogen complete this challenge is something I won’t forget in a hurry. I’m proud of our staff for giving up their time to help Imogen and the charity achieve something wonderful. In addition to our support services and research work, we also have an Innovation Centre based within the University of Wales Trinity St David, where bespoke equipment is designed and created, free of charge, to make children’s lives easier. Imogen’s bike was a specially-modified four wheeled downhill mountain bike, designed and made predominantly for use by disabled people. It was created by Calvin Williams of Project ENDURO – a collaboration between experts at Swansea University, Gower College Swansea and the University of Wales Trinity Saint David. Project ENDURO kindly loaned the bike to Imogen for the climb and designers at our Innovation Centre made modifications to give Imogen the support she needed. Project ENDURO was supported by AgorIP, based at Swansea University’s School of Management, who are part funded by the European Regional Development Fund through the Welsh Government. 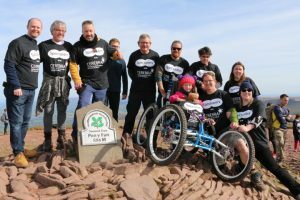 Terry Osborn, acting Head of Corporates, Trusts and Legacies at Cerebra, says: ‘We’re delighted to have joined the Specsavers team for the Pen y Fan climb. To be able to take Imogen with is us was a privilege and really does demonstrate that we don’t believe there is any challenge that can’t be overcome.